Deepika Padukone starrer 'Chhapaak' is one of the most anticipated movies of the year. Deepika is playing the role of an acid attack survivor and fans simply can't wait to see her in Meghna Gulzar's directorial. Today, Deepika took to her Instagram profile and shared the first look of her film and stunned the fans. The most beautiful woman Deepika Padukone never leaves an even a single part of the character unexplored and with Chhapaak she has gotten into the skin of an acid victim survivor and the first look is a proof that the actress can put her conviction into anything to make it look perfect. 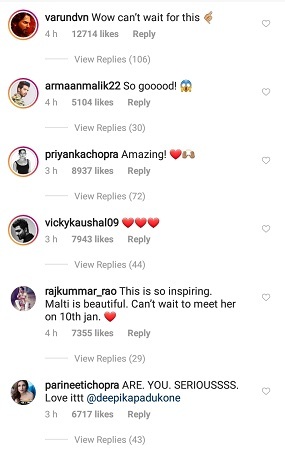 As soon as Deepika shared the first look, the comments section flooded with praises from not just fans but members of Bollywood as well. 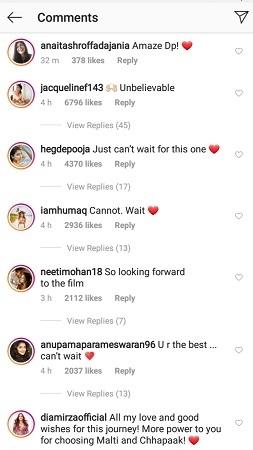 Varun Dhawan commented, "Wow can't wait for this "
Priyanka Chopra commented, "Amazing! " Jacqueline Fernandez in disbelief commented, " Unbelievable"
Parineeti Chopra's comment was of shock as well "ARE. YOU. SERIOUSSS. Love ittt "
Rajkummar Rao is as excited as all the fans as he comments, " This is so inspiring. Malti is beautiful. Can't wait to meet her on 10th jan.
Dia Mirza wished Deepika luck as she comments, "All my love and good wishes for this journey! More power to you for choosing Malti and Chhapaak! " Vicky Kaushal, Kartik Aaryan, Aditi Rao Hydri and others were all hearts for the actress. Deepika's role in COCKTAIL as the fiercely independent Veronica was the turning point in her career. Ever since the stunning performance in the film, the actress has been essaying varied characters, from a doting daughter and self-independent working woman in PIKU, dedicated and sincere Naina in YEH JAWAANI HAI DEEWANI,fearless and decisive Leela in RAM LEELA and symbol of strength, valor and courageous as Rani Padmaavati in PADMAAVAT ;The actress has played some life-changing roles. Now with Chhapaak, which is about determination and the undying human spirit of not giving up despite adversities at every step Deepika is playing yet another challenging role. The most beautiful woman, Deepika Padukone is currently gearing up for her first production venture which will have her essaying the role of an acid attack victim as the film goes on floors on 25th March 2019. The actress believes the story needs to be told and has bankrolled her maiden production to put forth a strong, brave, courageous and independent female character. Yo Yo Honey Singh REVEALS his Plans for this Year! Check out Mahesh Babu clicks a selfie with his Wax statue!